To celebrate the life of jazz icon, Amy Winehouse and to raise vital funds for the Amy Winehouse Foundation, on September 13 - the day before what would have been, Amy’s birthday – Century members are given the exclusive first look of ‘Hope’, a collection of beautiful shoots with the fresh-faced young star by acclaimed photographer, Phil Knott in the early Noughties, as she took her first steps into the limelight. The evening will also feature an auction of extraordinary, one-off artworks by celebrated artists including Mason Storm, Dan Pearce and Finn Stone. All of the auction money will go to the charity, set up in her memory, to prevent the effects of drug and alcohol misuse in young people and to help them reach their full potential. 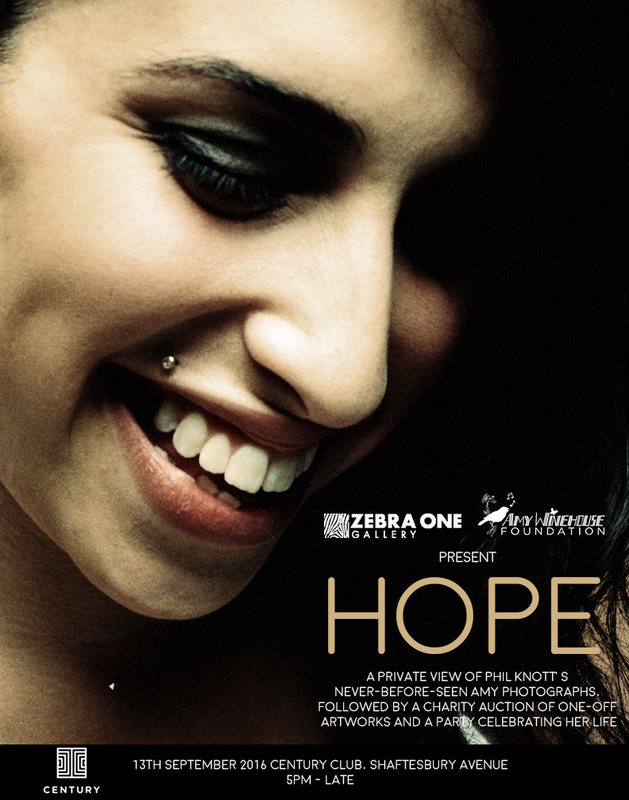 Knott is behind the seminal images of a galaxy of music stars, from Prince and Liam Gallagher to Chris Martin and Justin Timberlake, but Amy stood out for him. The images will then be displayed to the public at Zebra One Gallery.